What Happens the First Day of Session? The 104th Legislature convenes on January 7, 2015. This begins the first session of a two year legislative cycle, or biennium. Each biennium contains a long session (90 day session) and a short session (60 day session). 18 new senators, 17 of whom were elected in November will take their oath of office that morning. The 18th senator was appointed by the Governor to replace State Senator Charlie Janssen who was elected State Auditor in November. Legislature and Chief Sergeant of Arms. Then, the body votes for its leadership, beginning with Speaker of the Legislature. The Speaker sets the daily agenda and can designate up to 25 bills as Speaker priority bills. These 25 bills, along with committee and senator priority bills, receive preference over other bills for floor debate. Two of my bills, LB 368 (2013) and LB 719 (2014), received Speaker priority designations in previous years. Following the election of Speaker, the Legislature elects chairpeople for Committee on Committees and Executive Board by secret ballot. This unique method of electing leadership and committee chairs plays an important role in maintaining the integrity of our nonpartisan Unicameral system. In Washington DC, and all other states, the majority party determines who serve in leadership and as committee chairs. Unfortunately this leads, in many cases, to chairs being selected based on the amount of money that they raise for their political parties or on other political criteria instead of on whether they have the skills and experience for the position. In Nebraska we have a strong tradition of selecting chairs of both parties with experience and expertise to run our committees well. I am running for Chair of the Urban Affairs Committee. I currently serve as Vice Chair for this committee. Urban Affairs deals with policies concerning local government, some utilities, and economic development. Because of our unique nonpartisan structure, our committee assignments also do not work like Congress or any other state. In Congress and all other states, party caucuses determine who sits on each committee. 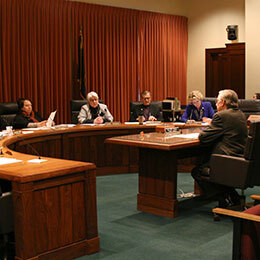 In Nebraska, we designate a nonpartisan Committee on Committees to determine membership on each of the committees. The Committee on Committees meets after the election of the chairs of the committees to select members of the committees. Bills can be introduced during the first ten days of session. This year, due to the election of leadership and other agenda items on the first and second day of session, bill introduction starts on Day 3. Bills are assigned a bill number based on the order in which they are introduced. In 2013 (the last long session), senators introduced 655 bills, compared to 460 bills introduced last year during the short session. What Do You Plan to Introduce Next Session? As I mentioned earlier, to receive consideration this session, all bills must be introduced during the first 10 days of session. Here are a few issues I plan to tackle next session. A full list of bills will follow in January. Two of the bills I will introduce are issues I worked on last session. One eliminates the integrated practice agreement for nurse practitioners. This bill passed on a 44-0 vote last session. Despite this overwhelming support, it was vetoed by the Governor after the Unicameral adjourned which meant we were unable to override the Governor’s veto. The second bill relates to taxation of military retirement income. In my time in the Legislature, I have introduced two bills on military retirement taxation (LB 238 and 902) and have worked hard to ensure that military retiree tax relief was part of the Tax Modernization Committee’s work on tax reform. Unfortunately, the legislation that passed last year under LB 987 only included tax relief for new military retirees beginning in 2016. Because the bill passed last year does not provide tax relief for military retirees who have already chosen to live and work here and therefore does not help us retain those retirees who have already made a commitment to our state, I will bring legislation again this year. Last session I introduced an interim study resolution regarding unfunded mandates to counties. One of the unfunded mandates identified involved the collection of motor vehicle sales tax by the County Treasurer’s office. In exchange for collecting these taxes for the state, counties receive a 2.5% commission on the first $3000 of motor vehicle sales taxes collected in the previous month. Prior to 2002, counties also received a .5% commission on tax collections over $3000. In many counties, the cost to collect these taxes far exceeds the current 2.5% commission. For example, the cost to collect these taxes in Sarpy County in 2013 was approximately $104,000 while the commission they received was only $900. This issue is one of several related to unfunded mandates I expect will be debated next session. How Do I Stay Up to Date on What’s Happening in the Legislature? Follow me on Facebook (fb.com/senatorcrawford), Twitter (@SenCrawford), or Instagram (sencrawford). In addition to keeping followers up to date on my work in the legislature, there is a daily “Today in the Legislature” post that will tell you issues before the Legislature and how to stream them live. 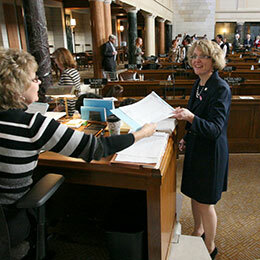 Newsletters, press releases, and other information can be found on my legislative blog at news.legislature.ne.gov/dist45/.